부여 정림사터에 세워져 있는 석탑으로, 좁고 낮은 1단의 기단(基壇)위에 5층의 탑신(塔身)을 세운 모습이다. 신라와의 연합군으로 백제를 멸망시킨 당나라 장수 소정방이 ‘백제를 정벌한 기념탑’이라는 뜻의 글귀를 이 탑에 남겨놓아, 한때는 ‘평제탑’이라고 잘못 불리어지는 수모를 겪기도 하였다. 기단은 각 면의 가운데와 모서리에 기둥돌을 끼워 놓았고, 탑신부의 각 층 몸돌에는 모서리마다 기둥을 세워놓았는데, 위아래가 좁고 가운데를 볼록하게 표현하는 목조건물의 배흘림기법을 이용하였다. 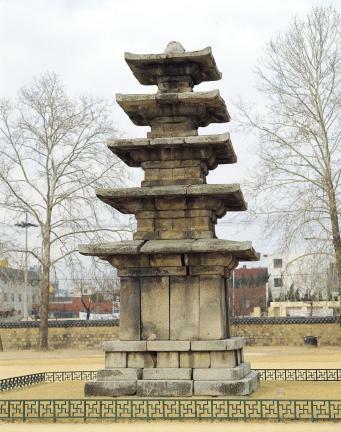 얇고 넓은 지붕돌은 처마의 네 귀퉁이에서 부드럽게 들려져 단아한 자태를 보여준다. 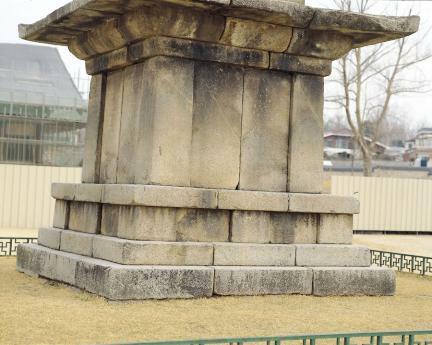 좁고 얕은 1단의 기단과 배흘림기법의 기둥표현, 얇고 넓은 지붕돌의 형태 등은 목조건물의 형식을 충실히 이행하면서도 단순한 모방이 아닌 세련되고 창의적인 조형을 보여주며, 전체의 형태가 매우 장중하고 아름답다. 익산 미륵사지 석탑(국보 제11호)과 함께 2기만 남아있는 백제시대의 석탑이라는 점에서도 귀중한 자료로 평가되며, 세련되고 정제된 조형미를 통해 격조높은 기품을 풍기고 있는 아름다운 작품이다. 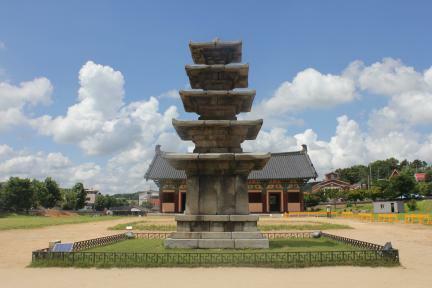 This elegant five-story stone pagoda of the Baekje period exhibits a refined structural beauty. 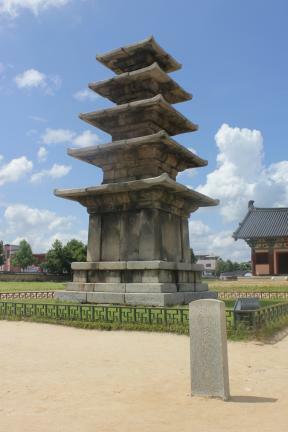 Su Dingfang, a general of the Tang Dynasty, made an inscription meaning “Pagoda Celebrating the Destruction of Baekje” on this pagoda, after destroying Baekje in alliance with Silla, hence the pagoda was once humiliated by being falsely called for some time as Pyeongjetap, meaning “celebrating pagoda on destroying Baekje.” The pagoda’s five-story body stands on a single narrow low platform, and stone pillars are fixed into the middle and corners of each side of the platform. 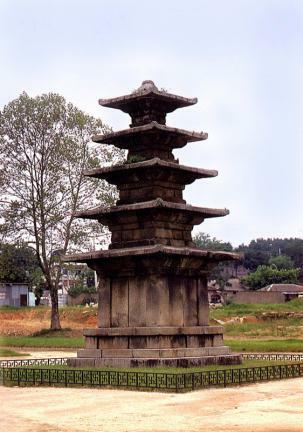 Pillars displaying the baeheullim style (narrow at the upper and lower part and convex at the middle of the pillar) stand at each corner of the stories of the pagoda’s body. 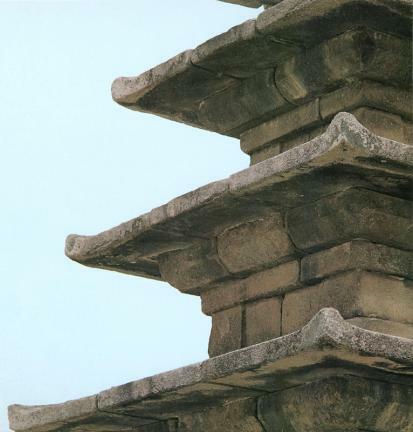 The roofstones are thin and wide, and raised at the end of the eaves to give it a nimble appearance. 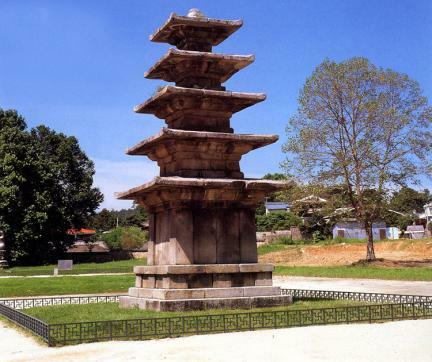 Overall, the pagoda has a similar structure to that of a wooden building, showing the significant characteristic of this pagoda. 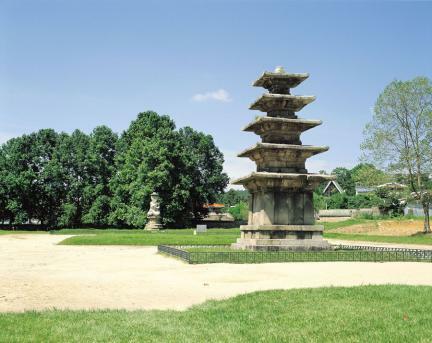 Although the pagoda faithfully follows the structure of wooden buildings, it is not a mere imitation but rather a refined and creative work. 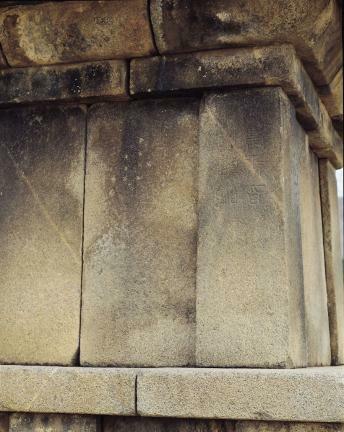 The figure in general is very majestic and beautiful. 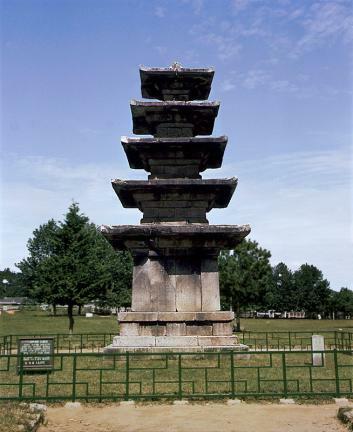 The pagoda is regarded as an extremely precious heritage, being one of only two extant stone pagodas of the Baekje Period along with the Stone Pagoda at the Mireuksa Temple Site, Iksan (Treasure No. 11).